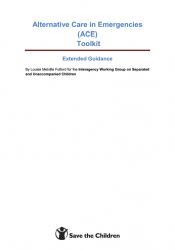 The tools and guidance in this resource, prepared by the Interagency Working Group on Separated and Unaccompanied Children, are designed to facilitate the process of planning for and implementing interim care and related services for children separated from or unable to live with their families during an emergency. They are based on learning from recent and current emergencies, drawing on the principles and standards set out in the key documents relating to separated children and out of home care. These are: the Convention on the Rights of the Child (CRC), Guidelines for the Alternative Care of Children, the Interagency Guiding Principles on Unaccompanied and Separated Children, and IASC Guidelines on Mental Health and Psychosocial Support in Emergency Settings. The guidance in this toolkit recommends methods that build on community norms and capacities beyond the emergency phase, looking also at the process of reforming and rebuilding.